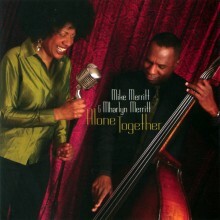 Alone Together is the first CD release from bassist Mike Merritt & vocalist Mharlyn Merritt...... both Philadelphia-born and bred in the great jazz tradition laid down by their father, Jymie Merritt (Art Blakey & Jazz Messengers, Max Roach, etc). They infuse new life into familiar jazz territory aided by funky horns and a fat groove on "You Don't Know What Love Is"..... add a jazz twist to Al Green's "Look At What You Have Done" with fine support from trumpeter Lew Soloff.......It's a family affair with addition of brother Marlon Merritt on guitar, featured on a smoky, bluesy reading of Mark Knopfler's "Fade To Black"..... Uri Caine's blistering piano solo propels the samba-driven rhythms on "How Insensitive", sung in Portugese..... Other players sharing their talent on these sessions include Al Kooper on organ, Jimmy Vivino on guitar, Jerry Vivino on tenor saxophone, John DiMartino on piano, James Wormworth on drums and Mark Pender on trumpet. They are all part of a wonderful cast of musicians called upon to help create the sounds to be found on this debut CD, the first from Emerrittus Recordings..... A common thread here is the power and emotion of Mharlyn's voice, evoking the spirit and texture of the great mid-20th century jazz vocal style defined by Billie Holliday. The solid, strong support from Mike's bass is a direct link to one of the great bass masters of the hard bop era, Jymie Merritt. Alone Together represents a look in both directions.... the jazz vocal legacy of the past infused with fresh performances from dynamic players with attitude.